Digital Teacher Smart classroom/ Digital Classroom aims to redefine modern age teaching with a focus on understanding the present and future education obstacles. Digital Teacher promotes new modes of learning and developing path-breaking products and solutions. It also leverages information technology and the Internet to make the education system more effective. Today’s technology is providing a better learning environment. Teachers have the ability to engage their students in group activities, administer tests etc. As educators, there is nothing more fulfilling than seeing a class full of students who are engaged and excited to learn. This is revolutionizing the classroom experience for our students and teachers alike. A wide combination of Multimedia elements such as 3d, 2d, Video, Animations, Rich Graphics, and real-time images and text etc. are blended properly to deliver lessons. Neutral accent English narration is used for the benefit of learners. Very easy to use i.e. plug and play. The graphics-rich User interface makes learner to reach his/her desired topic in few clicks. 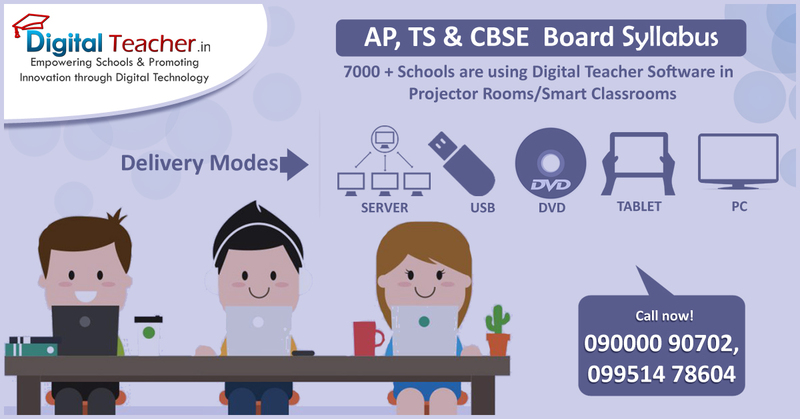 Content matches 100% with state (Andhra Pradesh Board and Telangana Board) syllabus and also CBSE syllabus. 6000 Schools are using Digital Teacher as their teaching technology Partner. Buy Digital Teacher Smart classroom Solution and make your classroom into a smart classroom and take your experience to the next level. Give your students a rich content by providing interactive learning Environment!! It’s not simply about technology – it’s about what technology can do for students and teachers to make learning deeper, more immediate and more powerful. Smart Classrooms provides direction for harnessing the learning and business potential of ICT now and into the future. It’s an advanced technology implementation for schools!